A late goal by debutant Paul Smyth gave Northern Ireland a 2-1 friendly win over World Cup qualifiers South Korea. The Queens Park Rangers forward fired a low drive into the bottom corner in the 85th minute soon after coming on as a substitute. Kwon Chang-hoon had given the visitors an early lead with a neat finish. Northern Ireland equalised when Jamie Ward's cross from the right, after a clever Oliver Norwood free-kick, was turned into his own net by Kim Min-jae. The match was the first of nine for Northern Ireland this year, which will form the build-up to the start of the Euro 2020 qualifying campaign in March 2019. The game also marked their return to action for the first time since the controversial two-legged World Cup play-off defeat by Switzerland in November, and since manager Michael O'Neill agreed a new improved contract to remain in charge until 2024. South Korea dominated the early stages and edged ahead when Kwon ran onto a defence-splitting pass by impressive Tottenham striker Son Heung-min, took one touch and rifled a shot past debutant Trevor Carson for his fourth international goal. The hosts were level in the 20th minute when Norwood played a free-kick to the side of the South Korean defensive wall and defender Kim got the final touch to Ward's pass. Josh Magennis had an effort tipped over by Kim Seung-gyu after the break, but South Korea had the better of the chances in the second half, Lee Jae-sung shooting narrowly wide twice, Carson saving a deflected Park effort and Ryan McLaughlin blocking from Kim Shin-wook. But Smyth's spectacular late finish saw him become the first Northern Ireland player to score on his debut since George McCartney against Iceland in 2001. The former Linfield striker was only called into the squad on Friday, having been drafted in from the under-21 squad that is playing in Euro 2019 qualifiers. The game had something of the feel of a new era for O'Neill's side, as Norwich full-back Jamal Lewis made a competent first appearance, Kilmarnock's Jordan Jones started for the first time and goalkeeper Carson earned his first cap after being understudy to first-choice Michael McGovern in recent years. The Motherwell stopper, the subject of two failed bids by Celtic during the January transfer window, made several good saves, palming away Son's fiercely struck angled drive in the first half and denying Park in the second. Captain Steven Davis was one of several regular first-teamers missing, the Southampton midfielder having played in all of his country's previous 28 games, but Norwood and man-of-the-match George Saville successfully filled the void left by his absence in midfield. South Korea's defeat ended a run of eight matches unbeaten, their last loss having been a 3-1 reverse to Morocco in October 2017. Shin Tae-yong's side have qualified for a ninth consecutive World Cup finals, the only country outside Europe and South America to be an ever-present since 1986, and their players were eager to impress with places on the plane to Russia this summer at stake. South Korea will next play Poland on Tuesday, then face Honduras, Bosnia-Herzegovina and Bolivia before taking on Sweden, Mexico and Germany in Group F at the finals in June. 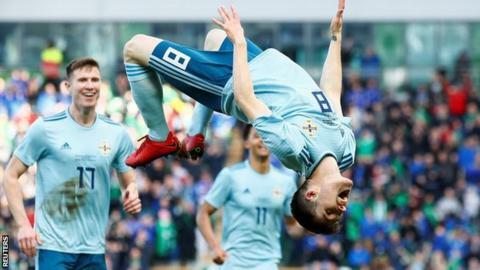 Northern Ireland are next in action against Panama on 29 May and Costa Rica on 3 June, then face difficult opposition in the form of Bosnia-Herzegovina and Austria in the inaugural Uefa Nations League in the autumn. Match ends, Northern Ireland 2, South Korea 1. Second Half ends, Northern Ireland 2, South Korea 1. Foul by Kim Min-Jae (South Korea). Attempt missed. Kim Shin-Wook (South Korea) header from the centre of the box is close, but misses to the left. Assisted by Yeom Ki-Hun with a cross following a set piece situation. Yeom Ki-Hun (South Korea) wins a free kick on the left wing. Goal! Northern Ireland 2, South Korea 1. Paul Smyth (Northern Ireland) right footed shot from the centre of the box to the bottom left corner. Assisted by Conor Washington with a headed pass. Attempt blocked. Lee Chang-Min (South Korea) right footed shot from outside the box is blocked. Foul by Jung Woo-Young (South Korea). Paul Smyth (Northern Ireland) wins a free kick in the defensive half. Substitution, Northern Ireland. Paul Smyth replaces Jordan Jones. Attempt missed. Lee Chang-Min (South Korea) left footed shot from outside the box is too high. Assisted by Lee Jae-Sung. Attempt blocked. Lee Chang-Min (South Korea) right footed shot from outside the box is blocked. Assisted by Hwang Hee-Chan. Attempt blocked. Jung Woo-Young (South Korea) right footed shot from the centre of the box is blocked. Assisted by Lee Chang-Min. Corner, South Korea. Conceded by Conor McLaughlin. Attempt blocked. Kim Shin-Wook (South Korea) right footed shot from the centre of the box is blocked. Assisted by Lee Jae-Sung. Substitution, South Korea. Yeom Ki-Hun replaces Son Heung-Min. Corner, South Korea. Conceded by Craig Cathcart. Attempt blocked. Son Heung-Min (South Korea) left footed shot from the right side of the box is blocked. Assisted by Lee Chang-Min with a headed pass. Substitution, Northern Ireland. Paddy McNair replaces Oliver Norwood. Son Heung-Min (South Korea) wins a free kick on the left wing. Liam Boyce (Northern Ireland) wins a free kick in the attacking half. Corner, Northern Ireland. Conceded by Kim Min-Woo. Substitution, Northern Ireland. Craig Cathcart replaces Jonny Evans. Substitution, South Korea. Lee Chang-Min replaces Park Joo-Ho. Substitution, South Korea. Jung Woo-Young replaces Ki Sung-yueng. Park Joo-Ho (South Korea) wins a free kick on the right wing. Attempt missed. Jang Hyun-Soo (South Korea) right footed shot from the right side of the six yard box is too high. Assisted by Son Heung-Min with a cross following a corner. Corner, South Korea. Conceded by Gareth McAuley. Attempt blocked. Lee Jae-Sung (South Korea) left footed shot from outside the box is blocked. Assisted by Kim Min-Jae. Substitution, Northern Ireland. Conor Washington replaces Jamie Ward. Substitution, Northern Ireland. Liam Boyce replaces Corry Evans. Substitution, South Korea. Hwang Hee-Chan replaces Kwon Chang-Hoon. Corner, Northern Ireland. Conceded by Kwon Chang-Hoon. Attempt blocked. Kim Min-Jae (South Korea) right footed shot from the centre of the box is blocked. Assisted by Son Heung-Min. Corner, South Korea. Conceded by Trevor Carson.